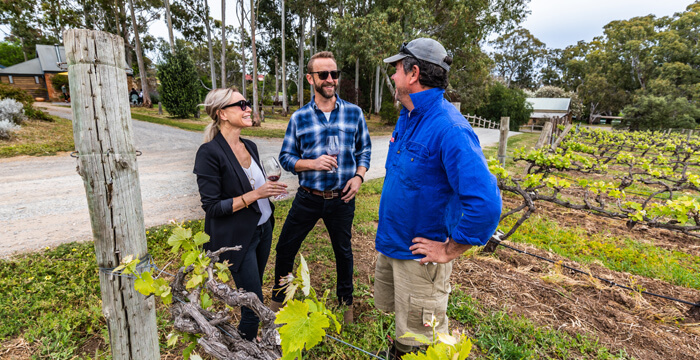 There is no better place to learn from expert winemakers than the beautiful, world-renowned region of McLaren Vale. We’ll journey behind the scenes to discover the best wine experiences in the region, starting with a tour of Wirra Wirra’s historic Barrel Hall, followed by a masterclass in its original cellar door. Next enjoy Hugh Hamilton’s famous wine discovery, the “Tasting of the Senses” experience. Then enjoy a majestic beach drive, lunch at the Victory Hotel or Star of Greece, and a masterclass at Bekkers Fine Wine to finish. Premium, iconic, artesanal – there is a whole world of wines to be discovered! Enjoy Hugh Hamilton's "Tasting of the Senses"
Journey behind the scenes to discover the best wine experiences in the region. Kick things off with an exclusive tour of Wirra Wirra’s historic Barrel Hall and Hugh Hamilton’s Tasting of the Senses. Next, we’ll head to Silver Sands Beach where, as the name suggests, golden sand stretches along the coastline as far as the eye can see. Take a relaxing moment to stroll along this remote beach, or enjoy the scenery as we drive alongside lush rolling sand dunes. With our appetites worked up, our next stop is the Victory Hotel Cellars or Star of Greece for a three course lunch and wine exploration, before we take a moment to admire the incredible views of the McLaren Vale coast. Our final wine experience of the day is Bekkers Fine Wine where we uncover the philosophy behind this prestigious label – masterclass and vineyard tour to finish.